I am a bit of a freak when it comes to Christmas. I recently signed up for a Vintage Christmas Stocking Swap. I am a bit swapped out lately, but when I saw this one posted I really wanted to sign up and participate. 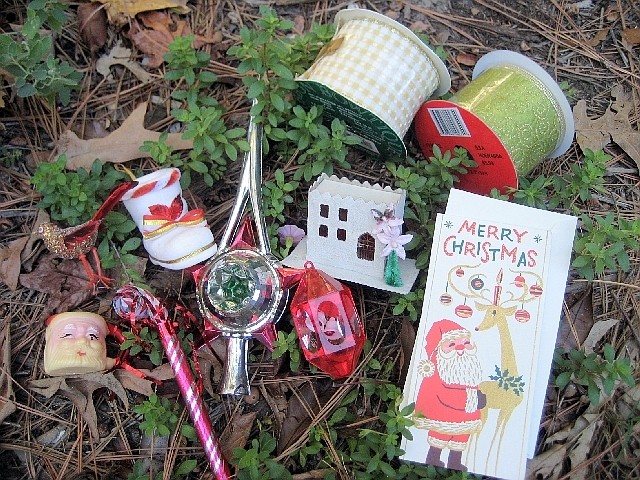 I love collecting vintage Christmas items and I love to decorate my house for Christmas. Last year I put up 9 decorated trees and assorted decorations. I’m sure that I will be boring everyone soon with posts about all my funky vintage christmas decorations. 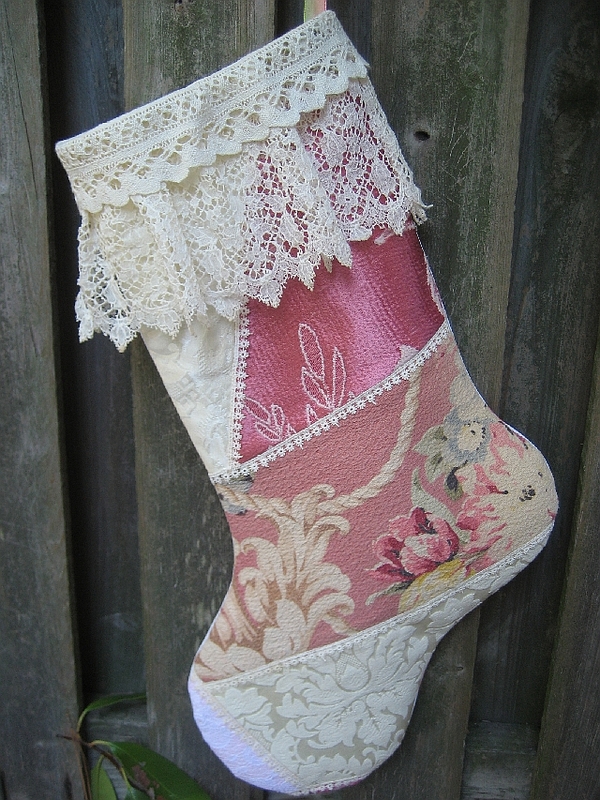 Anyway, this swap was proposed as a challenge to create a stocking with a "vintage" theme in mind. And then stuff the stocking with any type of christmas goodies. 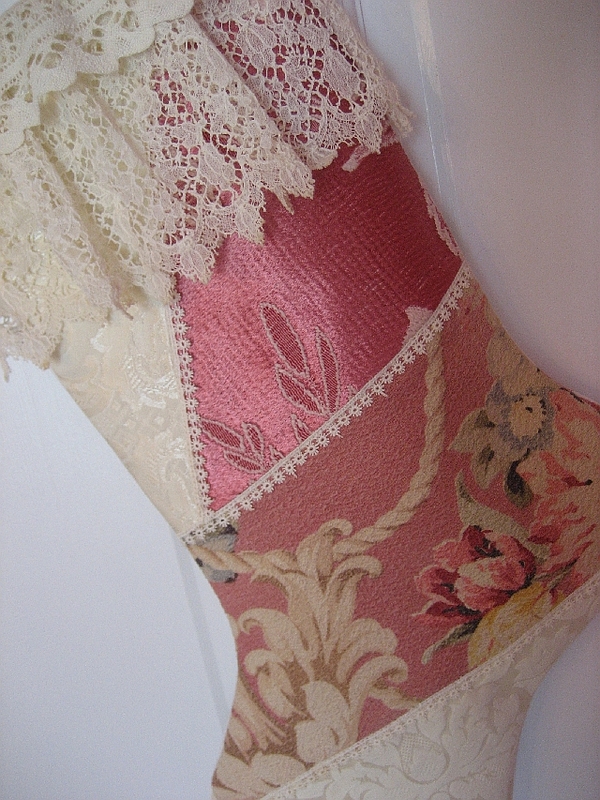 I love to make stockings and I love to sew and I love vintage fabrics! Perfect! BUT, I was paired up with a partner, Svenja. And can you guess from her name, she lives in Germany. Well, talk about pressure! Germany is only the birthplace of all things Christmas awesome! I just this August took a trip with Mr GeorgiaPeachez for our 20th anniversary. We visited friends in Garmish, Germany which is in Bavaria. SO lovely! This was my second trip to Germany and I love it there. Just an incredible place. Here are pictures of the stocking that I made from beautiful vintage fabrics and laces and the goodies that I selected to include with it for Svenja. It’s lovely Suzy. I’m sure she’ll be thrilled. I for one will not get sick of any and all Christmas posts. Bring it on!! it is all so beautiful Suzy! I’m a Christmas freak as well! I’m completely ready to be done with Halloween and onto Christmas, but everyone would think I was nutso! I love your site and the stocking is beautiful. Can’t wait to see you at the NOV FLEA! 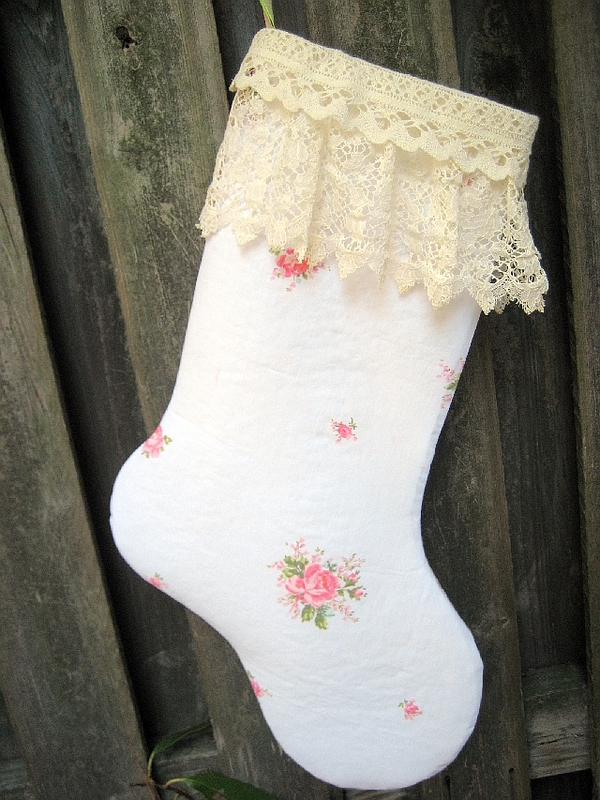 Your vintage-inspired Christmas stocking is gorgeous! And, thank you for posting a comment on my blog with who Svenja is! She’s going to love your stocking and contents! This makes me want to sew stockings, too! How fun!! Looks beautiful, I’m sure she will love it. I love xmas too. I don’t mind that they start playing xmas music in some stores now before Thanksgiving is even over. Makes my mom really cranky though. LOL! That stocking is gorgeous! I just love christmas! Thank you for your comments on my son. I can’t wait to see your Christmas decorations. 9 trees how wonderful!!! The stocking you made is so lovely. I too am in this swap. Pretty stockings 🙂 Come on Christmas! Love that barkcloth stocking- I don’t think I’d ever put it away! Looking forward to your seeing your Christmas decorations- I love vintage Christmas! I would Love a pair to wear! That stocking is gorgeous. I’m working on mine too. Thanks for the ideas about what to put in it. Love the stockings, what wonderful items for a swap. Love looking through your blog, hope you’ll come swing by mying soon. Your stocking and all the goodies are simply scrumptious!!! What a treat for Svenja!! (sigh) How do I keep missing out on all these lovely swaps? So not fair! Oh, believe me – I, too, will NEVER be bored by any posts that involve vintage Christmas anything!! They sooner they start – the better – and keep ’em coming!! I love it all, too, love collecting and decorating with vintage. I’ll be looking forward to all of it! Thank you so much Suzy, for this wonderful stocking! I love the details and love all the goodies you filled in. The fabrics are so beautiful!